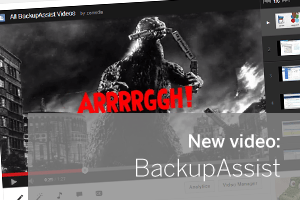 Just a quick one to let you know I’ve just added a video with the shortest possible explanation I can manage of why BackupAssist should be of interest if you’re a small business (or work with one). I hope you enjoy this latest addition to our Youtube channel – please hit the subscribe button if you’d like to be notified of future updates. Don’t forget, we’re always running free webinars for all of our products so if you’d like a more in-depth walk-through with one of our friendly tech team, you’ll find more info on those sessions along with a registration form available here.